"THE FUTURE OF LIGHT IS FACING BIG CHALLENGES"
Lighting designer Robert Jan Vos: "The fuiture of lighting is facing big challenges. We have an increasing need for knowledge." Dutch lighting designer Robert Jan Vos has been working for 26 years as a lighting consultant. During this time he has carried out a number of prominent projects in the field of interior and exterior lighting in which he cooperated with renowned architects, lighting designers and light artists, such as Hans Wolff, Ellen de Vries, Rienk Visser and Kees van de Lagemaat). He was also the designer of the complex lighting plan for five subterranean treasure-chambers in the Portuguese synagogue in Amsterdam, a unique project throwing up some big challenges for a lighting designer. The lighting plan for the Jewish Historical Museum is another project on his curriculum vitae, as is the 'Ateliergebouw' of the Rijksmuseum in Amsterdam, and a part of the Hermitage Amsterdam, a branch museum of the Hermitage Museum in Saint Petersburg, commissioned by Hans Wolff, with whom he worked together on this project. Robert Jan Vos became fascinated by light from early on in his career. Before starting his own company in 2009 he worked for many years for a number of television companies as a freelance lighting technician and electrotechnical designer and also for several companies as a designer. Robert-Jan is a Professional Member of the PLDA (Professional Lighting Designers 'Association) and a member of the Board of the NSVV (Dutch Foundaton of Illumination). Robert Jan: "I got particularly interested in light when I was working for television and especially when filming on location and making television reports. I was also fascinated by the way light could be built up. I learned a lot about the perception of light, and the impact that the pictures you take as a cameraman can have. In that way, I learned to look at light, not from a technical point of view, as you often see, but how people perceive light. A lighting engineer often looks at the technical aspects of light. For example, when he has to illuminate a building, he has to take into account the illluminance, luminance and glare. But he rarely considers how people perceive light. In the perception of light, human beings and the environment are crucial. When you look at the regulations, then the functional requirements are, of course, most important. But when you look at how people perceive light, you take the 'soft' side of light more into account, the way people experience light." Interestingly, after 10 years only one driver of the whole installatation broke down. The rest of the installation is still fucntioning properly." First floor of the Jewish Historical Museum in Amsterdam. Lighting design by Hans Wolff and Robert Jan Vos. "Designing the lighting for a museum is beautiful. By lighting up the objects, you involve people in a story." 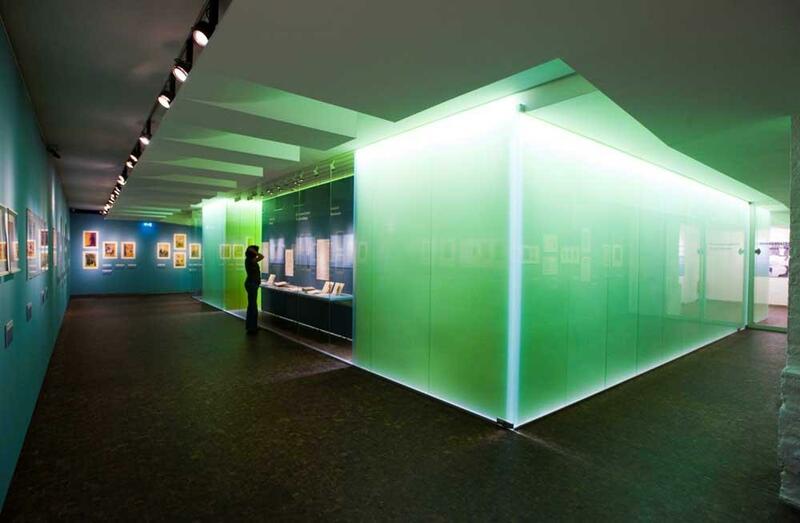 The lighting for the Print Gallery of the Jewish Historical Museum in Amsterdam. 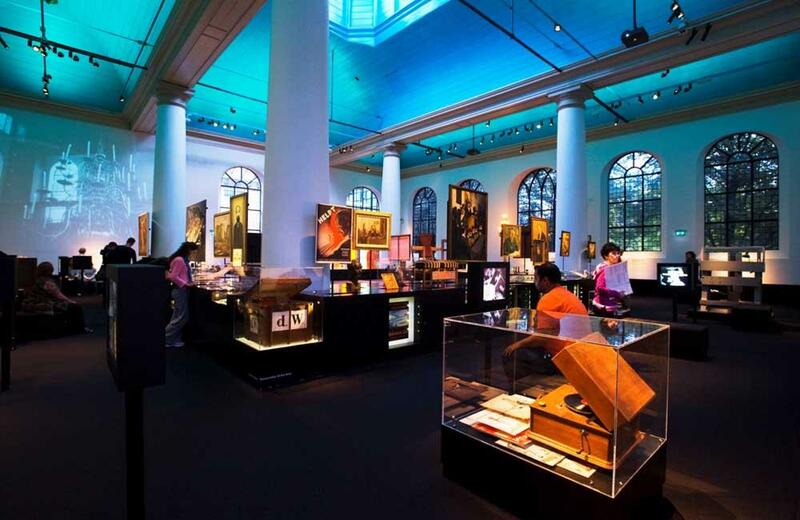 The Jewish Historical Museum in Amsterdam was founded on 23 May 1930. The complex of buildings consists of four synagogues. The lighting plan was conceived by Hans Wolff and Robert-Jan Vos and particularly emphasizes the art objects in the museum through subtle lighting. In their approach, daylight and artificial light, as well as the architecture of the interior, were their guiding principles. Robert Jan Vos: "In the Jewish Historical Museum, we have lit the permanent exhibition room and the Print Gallery. There are many highly sensitive objects on display there. You must therefore actually design the overall lighting in such a way that it does not flood the lighting of the exhibition itself. Designing lighting for a museum is beautiful, by lighting up the objects, you involve people in a story. I always try to discover the story behind a person or an object and then adapt the lighting to it." "Building a bridge between aesthetics and technology." Robert Jan Vos has built up a reputation in the international world of lighting; he is frequently invited as a lecturer during congresses, seminars and workshops. He is the chair of the LED Lighting Commission of the Dutch NSVV and also a Board member of the NSVV. In addition, he is a Professional Member of the Professional Lighting Designers' Association, a title which represents important international recognition of one's creativity and know-how as a light designer. Robert Jan Vos: "I am not a light artist, but I try to build a bridge between aesthetics and technology. Between the light artist and the architect. In fact, I try to reinforce the image of the architecture. By doling so, you must, of course, always keep in mind the technical lighting requirements. On the other hand, you want to visualize the beauty of the objects you are lighting by accentuating the quality of the architecture or certain historical objects with your lighting concept, while on the other hand, you must make sure that the light complies with its visual task, for example as an orientation and navigation aspect. In this respect, light can be used to guide people, so that visitors know which way to go, it can also be a reference or orientation point, so that people also know where they are in a building." 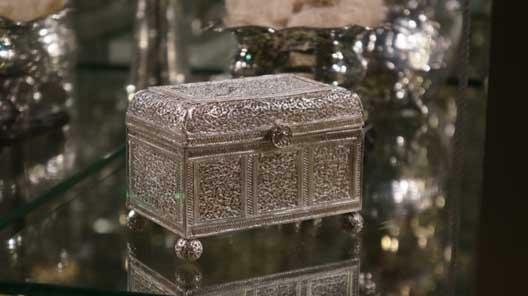 Silver casket in the Portuguese Synagogue in Amsterdam. Developments come and go rapidly, also in the world of lighting. After the incandescent light bulb came the halogen lamp, the low-energy light bulb, sensor technology, and we are entering the era of LED technology. Within the lighting industry and the lighting architecture world, the LED (light-emitrting diode) is creating a furore, since it is very energy-efficient and has a long life. Robert Jan Vos: "The development of LED technology is one of the biggest challenges we are facing today. We must try and make the LED lamps of equal value to conventional lamps. At the moment, the LED is still relatively more expensive and there is an imbalance in the colour spectrum of the LED. But LED technology will undeniably be the light of the future." 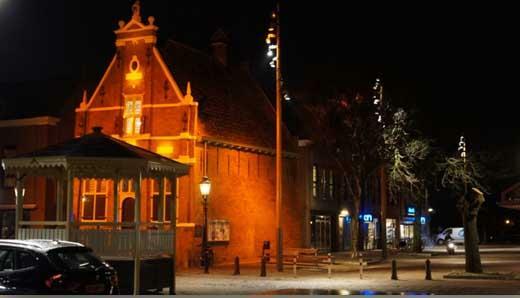 Illumination of the Reghthuys Square in Nieuwkoop (The Netherlands). The lighting of monuments and buildings designed by Robert Jan Vos.